The U.S. Forest Service, in partnership with the Grey Towers Heritage Association, sponsors a seasonal (Spring and Fall) internship program for undergraduate or recently graduated college students. Their interests focus on history, environmental science, hospitality and tourism. The Grey Towers Heritage Association interns work with the U.S. Forest Service and help deliver programs, conduct mansion tours and work in the gift shop. Each are given an assigned project to complete during their tenure at Grey Towers. The Grey Towers Heritage Association offers college students and recent graduates, in partnership with the U.S. Forest Service, opportunities to enhance their studies with hands-on experiences while helping to continue the legacy of the Pinchot family and conservation at the ancestral home. 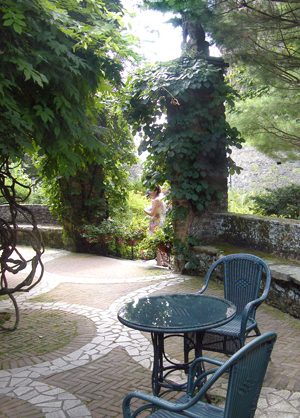 Applications currently are being accepted for a variety of college and post-graduate internships at Grey Towers National Historic Site, Milford, PA. College students who are interested in parks and recreation, history, gardening, horticulture and landscape architecture, museum services and forestry are encouraged to apply. Stipends range from $85 per week subsistence allowance to $2,500 for the 12-week season. Housing on the historic estate and uniforms may be provided. Two opportunities are available for May through August; each provides a valuable, practical experience for student who wants a hands-on experience. Deadline to apply is March 31, 2019. For the Elizabeth S. Mortimer internship, send resume and letter with field of study and expected graduation date to: Elizabeth Hawke, Horticulturist, Grey Towers National Historic Site, PO Box 188, Milford, PA 18337, or fax to 570-296-9675 or email to ehawke@fs.fed.us. A second horticulture position is available through the Student Conservation Association. Contact Elizabeth Hawke for more information and instructions on how to apply. Email ehawke@fs.fed.us. Multiple 12-week internships are available for students to deliver interpretive mansion tours and education programs, deliver visitor services and hone their communication skills. Deadline to apply is March 15, 2019. Send letter of interest to email greytowers@fs.fed.us or call 570-296-9672. We welcome applications for a 1-to-4 week writing retreat and residency at Grey Towers National Historic Site. Professional historians and graduate students with a research project on forest or natural history conservation, the USDA Forest Service or Gifford Pinchot and his family, are invited to apply for the opportunity to reside at Gifford Pinchot’s ancestral home, immersing themselves in the site where Pinchot gained the inspiration to write, legislate, and tirelessly work on behalf of forest conservation. Grey Towers offers recipients an idyllic setting for research and writing with few distractions which will inspire new directions and ideas on conservation and the Forest Service while speeding completion of their work. The program provides a single payment of $1,500-$3,000 to each award winner to fund travel expenses and per diem during their stay. Residency (not residence) recipients also will receive lodging in the estate’s Gatehouse or Farmhouse. While in residence, the scholar will give a presentation of their work at the conference center. This is a rolling application program. Applicants should send a copy of their curriculum vitae along with a two-to-three page description of their project indicating their progress to date to the chair of the awards committee below.